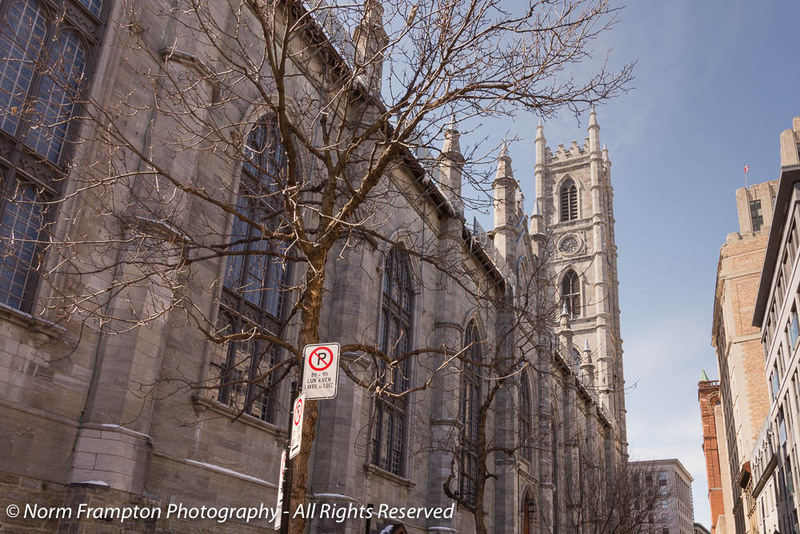 Across the square from the Bank of Montreal Head Office Building that we looked at last week, you’ll find the the city’s most famous and quite possibly most beautiful catholic church, the Notre-Dame Basilica. Note: In case you’re wondering these pics were taken back in mid-March when there was still snow on the ground. 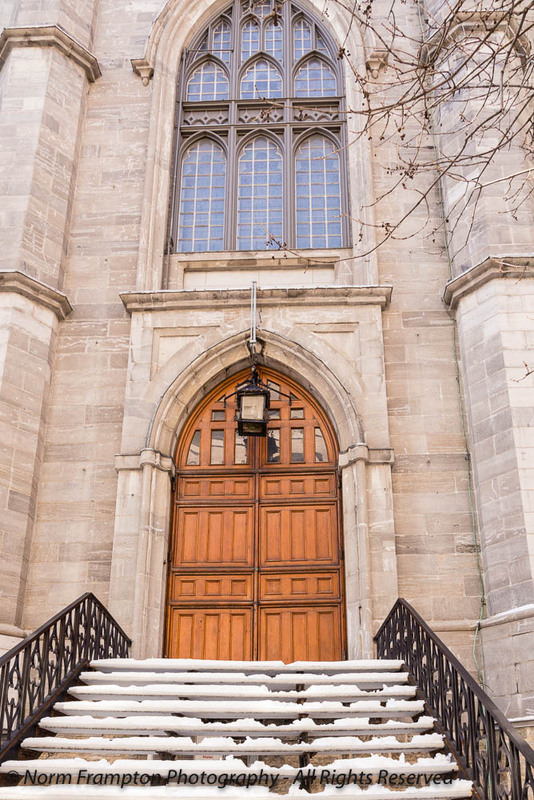 If you are a well-to-do or famous Catholic French Canadian living in the Montreal area, chances are that at least one of your important life events, baptism, wedding, or funeral, will be celebrated in this glorious building. The first Notre-Dame chapel in the French settlement known as Ville-Marie (later renamed Montréal) was built on this site in 1657. It was later expanded as a much larger Baroque style church between 1672 and 1693. By 1800 it was becoming clear that the congregation had outgrown the existing building and it was gradually decided that a new much larger church needed to be built. In 1824 an Anglican Irish-American architect named James O’Donnell was commissioned to design the new building. O’Donnell’s design was inline with the Gothic Revival style that was popular at the time. The bulk of the exterior construction took place between 1824 and 1829 using locally quarried stone. The sanctuary was completed in 1830, the first tower in 1841 and the second in 1843. Sadly O’Donnell did not live to see his work fully completed. He died in Montréal in 1830. Just prior to his death though, he had converted to Catholicism, perhaps due to the realization that he might not be allowed to be buried in his church which was his greatest work. To date he is the only person buried in the church’s crypt. 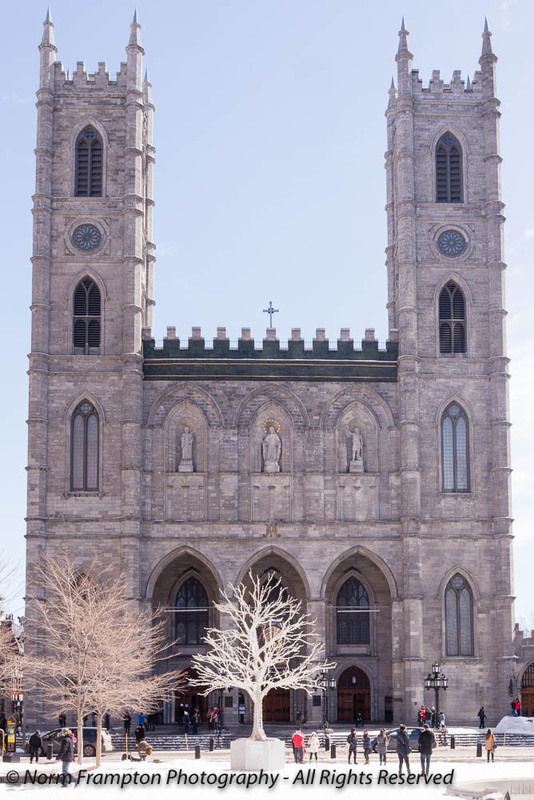 With a total capacity of about 2,700 sinners 😉 Notre-Dame was the largest church of any faith in all of North America for about 50 years after its completion. The interior, which I’m saving for another post later this year, mainly because I haven’t gotten the quality shots I want yet, was completed between 1872 and 1879. The majestic Casavant Frères pipe organ was installed in 1891. Here’s the door to the much smaller chapel built onto the rear of the building to accommodate smaller services. Okay, I dug up one old shot from my archives of the interior to tease you with – but I am going to get much better shots the next time I go – I promise! Want to join in on the fun and share your own Thursday Doors post with other door lovers? Click on the blue button below to add the link to your Thursday Doors post to our link-up list. 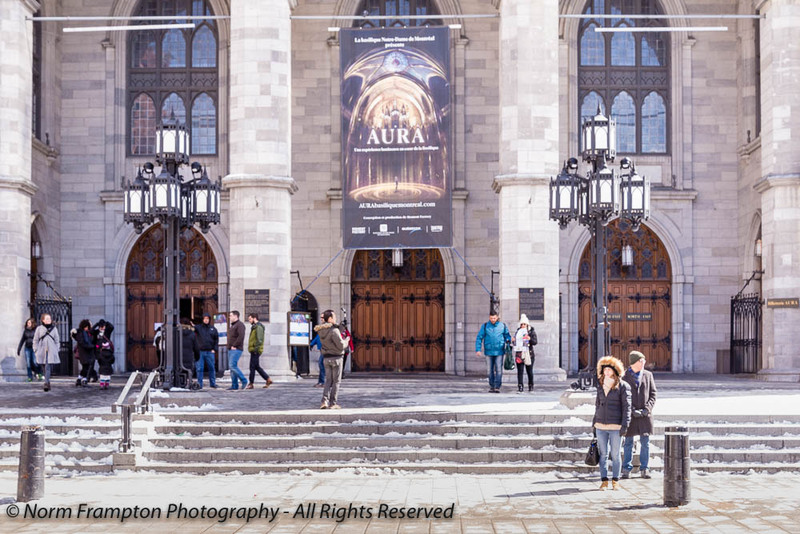 Gallery | This entry was posted in Photography, Thursday Doors and tagged Basilic Notre-Dame, Canada, Church, Historic Architecture, Historic Buildings, Notre-Dame Basilica, Old Montreal, Old Port of Montréal, Québec, Thursday Doors, Vieux Montreal. Bookmark the permalink. I liked the most elaborately carved design that I think the artist-architect, James O’Donnell is credited on your post. I like the way the stained glass looks like four leaf clovers or blossoms. Beautiful door post in so many ways, Norm. The doors are lovely but that roof has just blown me away . . . . . stunning. It’s exquisite! I cherish the stone, windows, and beautiful entryways with the curves, window transom, and iron stylistic layout. The inside picture is dazzling as well..
Another superb selection of doors! Thanks – the interior it is something to see. So much detail in the carvings, stained glass, paintings, it’s hard to take it all in in one visit. The huge wooden entry doors with awesome hardware was impressive. Seems like a huge mausoleum for the architect! And I like your archive photo of the interior. 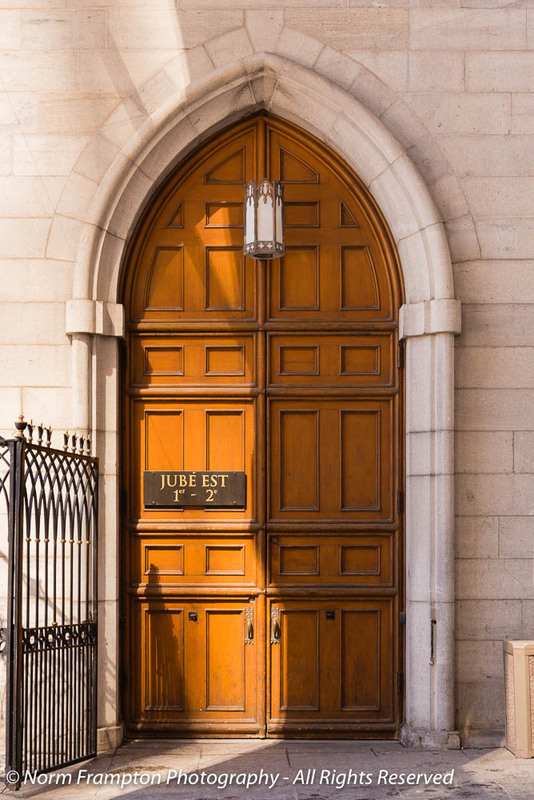 Love that door to the small chapel – the whole building is magnificent. Can’t wait to see more of the interior. I’m not catholic. It seems that all catholic churches are beautiful outside and inside. Beautiful doors too. I’m not religious myself but I do love the artistic skill and dedication that go into all the details in these places. My Sunday Evening Art Gallery post about doors (http://wp.me/s5LGaO-doors) pales in comparison to your wonderful weekly magic! I have been fascinated by doors for like ever! (How pedestrian a comment, eh?) I finally wandered around and found enough for one blog — but you show me there are enough for many MANY blogs! It’s a pleasure to have found you! Thanks for the kinds words and welcome Claudia! Fine ecclesiastic doors. Interesting contrast with my post from York Minister. Gorgeous church, doors, and interior. The blue colors in the ceiling are stunning. I am so grateful that I was able to see that magnificent basilica in person! I’m glad you included a shot of the interior – those colors are amazing. It’s gorgeous! 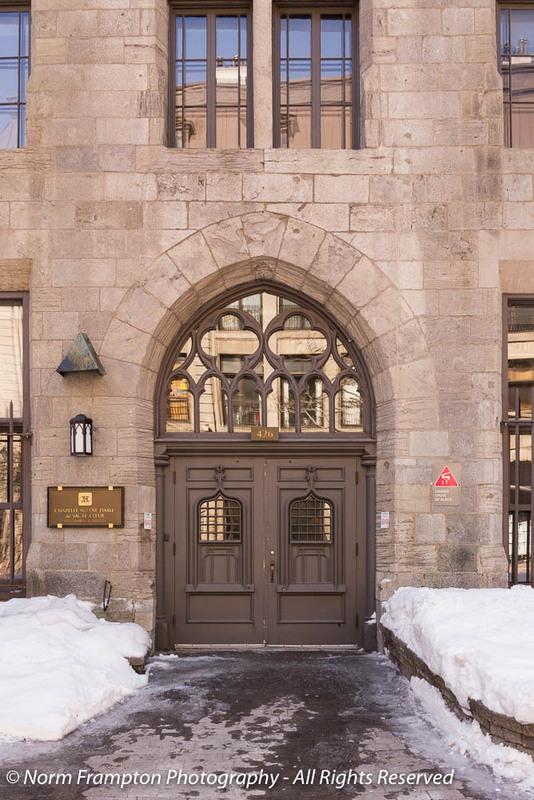 I love the stone, windows, and lovely doors with the arches, window transom, and iron decor. The interior image is gorgeous too. I’m looking forward to seeing more of the interior. Thanks Deborah. I’m looking forward to going back to spend a few hours really exploring the interior. There are so many details that it’s hard to take them all in. This church is on my bucket list because of the beautiful colors surrounding the altar. I hope you get to see it. If you get a chance to visit, you won’t regret it. I always marvel at how many people let out an audible gasp when they first walk in to the place. Hi Norm! I love these church doors 🙂 I have villa gates, but I’ll be posting church doors soon, too! Quite a fancy interior! I’m afraid I was baptized in a boring old Congregational Church! Oh Jan the interior is breathtaking. There are so many details that you can’t take it all in on one visit. You will see from my entrance I’m just a small town gal who lives close to the country. wonderful building. main doors are so pretty. love the reflection on the chapel door. and interior is so nice. 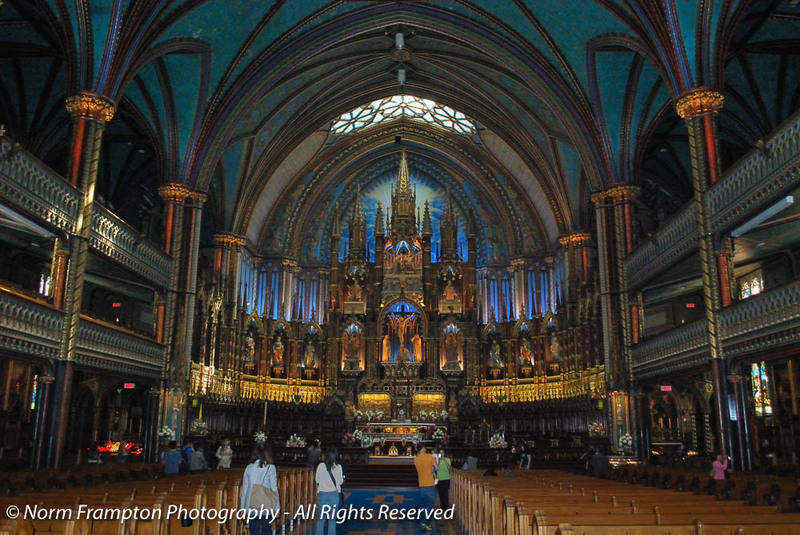 I love Notre-Dame, and try to spend a bit of time there whenever I get to Montreal. You’re right. It’s glorious. A stunning piece of architecture. I agree. It’s one of those places we never tire of going back to whenever we have friends in from out of town. I like that you always give us a bit of history. Stunning building – would love to see it in person someday! What a glorious building! Picture #3 has to be my favorite door, but that interior shot is like a view of a fantasy world! The colors and shadows and highlights — just marvelous! Such a beautiful building, who could blame the architect for changing ‘sides’ in order to be buried in it. Thanks Jean. I just wish I could’ve found out more about the selection process for choosing the architect. In those days, especially around, here folks kinda stuck to their own kind when it came to religion in their business dealings. I’m not a church-going person, but that is one pretty structure. Thanks for sharing! Thanks Tara. I’m not much for organized religion myself yet somehow I’m fascinated with the art and architecture in these places. Some of them can be so majestic. How grand! They are all beautiful doors on an amazing building, but the last set, on the smaller chapel, really does it for me. I think it’s the reflection. That’s very interesting about O’Donnell. I’m glad he gets to be with his work forever. I believe you. Is too much magnificence a thing?!? Wow, that is an impressive church! Been there many times growing up in Montreal! Oh my! 😮 This last one is quite good enough for me, Norm! And most excellent doors too! Thanks Janet. I’ve been in there a few times when the place was full for classical concerts – it is something special to see. What wonderful doors — and everything else. Nicely done, Norm. You’ve set the bar high for this week’s door posts. An impressive work of art!! From a distance, the doors didn’t look particularly unusual (large wooden doors, great hardware), but close-up I like the bevelled panes, intricate pattern to the hardware, and the little sections of stained glass in the transom window. I found it curious that this contract was assigned to an Anglican. I thought this was a time when there was great animosity between the Catholics and Anglicans. He definitely pulled out all the stops, didn’t he?! Thanks Joanne. I haven’t been able to find out anything about how or why he got the gig, but he sure did a great job. What a marvelous building, Norm. Great photos. 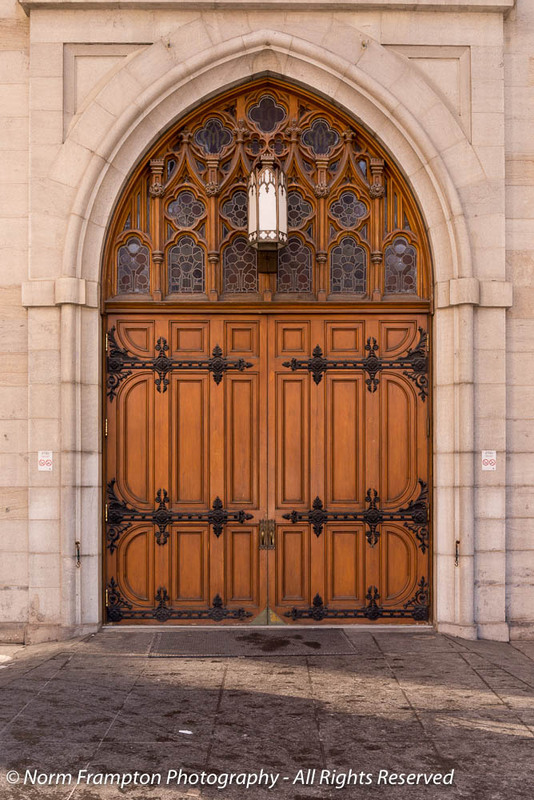 I love those doors, especially the one with the arched transom of paneled windows and the similar one with wood panels. I like how (at least) the lower panel is actually curved. In a lot of situations like that, they fake the curve by adjusting the molding detail, but that lower panel is curved. Thanks for the peek inside, it looks glorious. Thanks, as always for hosting this series. Wonderful doors, hardware, lights, and windows on a truly beautiful piece of architecture that has thrilled generations of visiting residents and visitors.